A reliable flashlight is as essential to your everyday carry kit as your wallet and cell phone. From emergency survival situations to daily tasks, you’ll be glad you’ve got a bright and tough flashlight on you when the time comes. The need for an EDC light is clear. Shopping a good one, however, can be an overwhelming process. That’s why we’ve compiled a list of features and considerations to keep in mind as you shop for your EDC device. Any piece of gear that travels with you every day needs to be tough. The routine impacts, exposure, and general punishment that comes with frequent use can take their toll on lower-quality devices to the point where they’re no longer reliable. 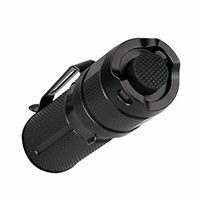 That’s why Fenix EDC flashlights utilize rock-solid materials like anodized aluminum, toughened glass, and stainless steel. Fenix flashlights are also resistant to moisture, dust, and sand, so you can rely on their performance even after subjecting them to harsh environments. A flashlight needs to perform to your expectations. While the term “bright” can be a relative term (See applications below), you want to have a device that’s capable of handling the tasks you’ll put before it. Beyond just being bright, an EDC light’s performance should be evaluated on run-times and efficiency. To reach the high standards set by their customers, Fenix has developed advanced LED technology that generates precise outputs, long run-times, and consistent performance. Beams are bright with crisp beam patterns, and LED heat emissions are handled with heat sinks and high-tech circuitry. All of this adds up to a light you can rely on every time you need it. Everyday carry flashlights are likely going to be more compact than utility lights and search lights. They’re also always on stand-by to be used in less-than-ideal circumstances like after an injury or during some other extreme survival scenario. All of that contributes to the importance of ergonomics and a user-friendly interface. The smaller the light, the less real estate there is for buttons and switches, meaning every inch needs to be thought out and engineered with purpose. Similarly, lights designed for survival situations need to consider how a user will utilize the light under stress or perhaps with one hand in the event of an injury. Fenix’s years of flashlight design and close work with military personnel has given their engineers insight into the most effective user interfaces for survival situations as well as overall ergonomics. 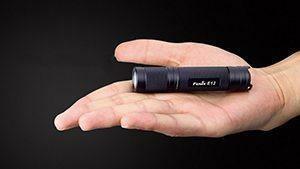 The size of your EDC flashlight should be a top consideration. Take in to account the way you'll be transporting your light. If you’re carrying in your pocket, you’ll need a light that’s under 5 inches in length. If a purse, rucksack or other kind of pack is already part of your EDC kit, you’ll open your options up to larger lights. The most important thing to remember is that the strength of this gear is the fact that it’s always with you. If you can’t comfortably carry the device every day, you’re limiting the effectiveness of the gear, and could find yourself in a tough situation without the tools for rescue. Fenix EDC flashlights are largely built to be easily carried in the front pocket of an average pair of pants. This gives a tremendous flexibility in where and how you transport your EDC light. Fenix EDC flashlights are generally powered by either CR123 batteries or AA batteries, with a few 18650 and AAA options thrown in for good measure. The first decision to make is, power vs. accessibility. While CR123’s are capable of generating higher outputs, they’re not as widely accessible as AA batteries, which can be purchased at any corner store throughout much of the world. The next consideration is shelf-life. CR123 batteries use lithium chemistry to get their power, which has an impressive shelf-life making these ideal for emergency storage. While AA batteries will lose significant power as they rest over time, CR123’s maintain much more of their original capacity year over year. Take a look at the tasks you’ll be using your EDC light for. You can get a good idea of the device you need based on the applications you’ll be faced with. If you’re an avid hiker in a rural part of the world, you’ll want a flashlight that’s capable of lighting up large outdoor spaces. If you’re living in a city and will mostly be using your light for spotting keyholes of lighting up the space between your car seats, a dimmer but more compact option will likely suit you just fine. Extra features like a self-defense strobe or signal beacon mode are also attractive for certain users.